This man might not have a lot of money to buy slippers for himself an yet he chooses to send his daughter to get an education. 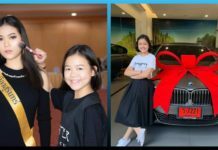 This post went viral and earned netizens’ praise for sending her to school despite their tough financial situation. This is beautiful. isn’t it? 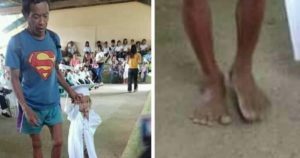 A lot of netizens could not help but admire a lot to this father for sending his daughter to school despite not having a lot of money. He could not afford to buy them slippers but he understands the value of education and sends her to school, anyway. The little girl was wearing a toga, with the two looking like they were on their way up the stage. Both were barefoot and her dad looks a bit embarrassed at the situation, seeing that the other parents were dressed well, yet he did not let their poverty stop his daughter from working on her dreams. 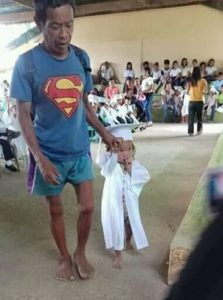 She’s still so small to think about the future, but many netizens are hoping she would continue going to school and that someday she and her dad would go viral again because she will be graduating from college! Many people believe that this family are not given government support through the 4Ps since that needs parents to spend money on their children’s school and basic needs – he would have to his daughter a pair of shoes with that money. 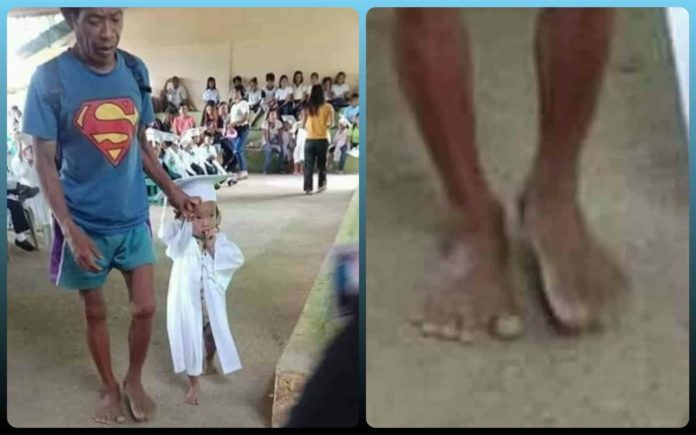 Many netizens are also praying someone would give this kid a pair of shoes and also a pair for her dad who is a construction worker.